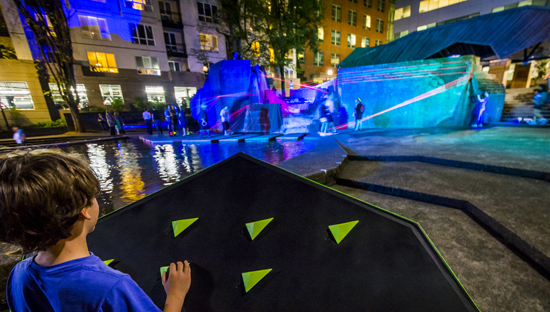 The Portland Children’s Museum’s Outdoor Adventure was honored with a 2014 Intertwine Force of Nature Award as an Outstanding Project at The Intertwine Alliance’s Fall Summit on November 18. 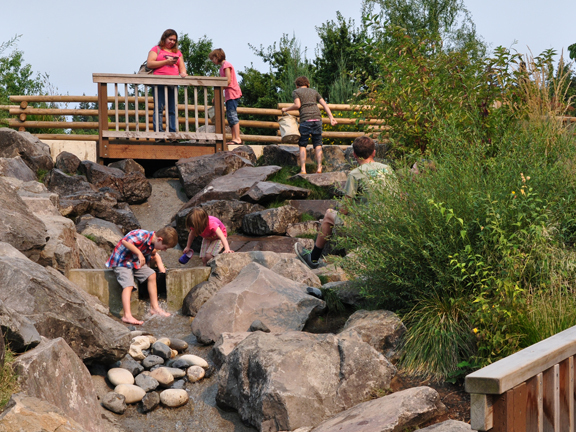 The peer nominated annual awards recognize efforts made within the 300-square-mile ecological region known as The Intertwine to advance a robust, region-wide network of interconnected natural areas, parks and trails. 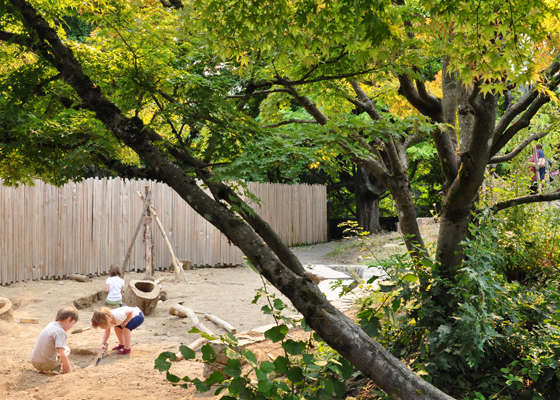 Outdoor Adventure at the Portland Children’s Museum received a Merit Award in the general design category for the education-based environment designed to inspire learning through outdoor play and connection to nature. 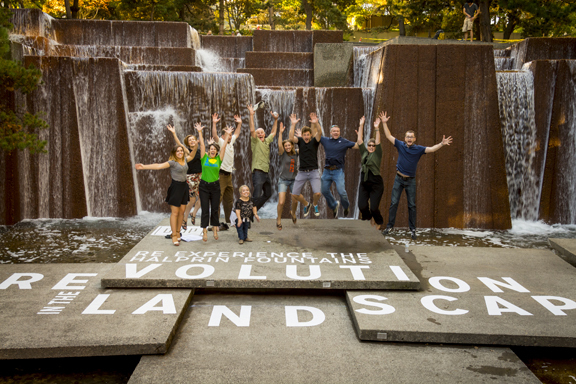 The Design Week Portland event Revolution in the Landscape: Re-Experience Halprin’s Fountains, produced by the Society for Experiential Graphic Design (SEGD) Portland Chapter, received a Merit Award in the research and communication category. Kathy Fry and Mike Sauer at our studio conceived and managed the event. Both are SEGD members and co-chair the Portland Chapter. 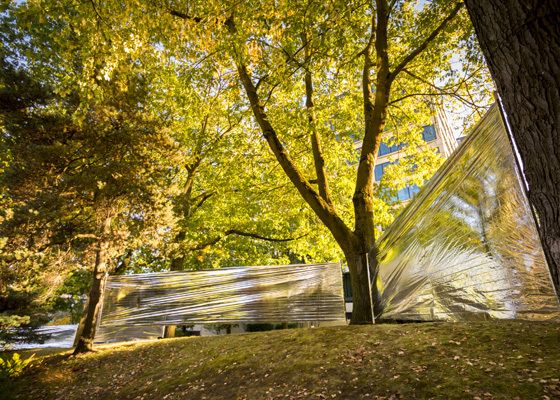 Seven teams were involved, each designing and installing a separate temporary art installation along Halprin’s Open Space Sequence. 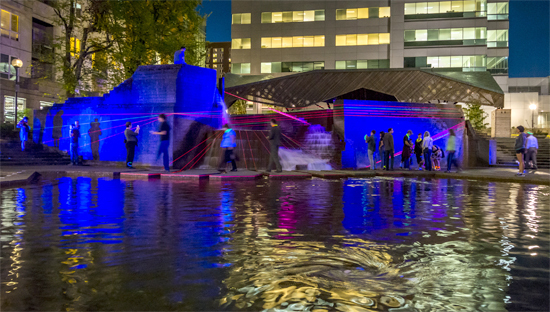 Mayer/Reed’s installation at Ira Keller Fountain titled “We Are All in This Together,” encouraged attendees to re-engage with Halprin’s 45 year old historic urban spaces. 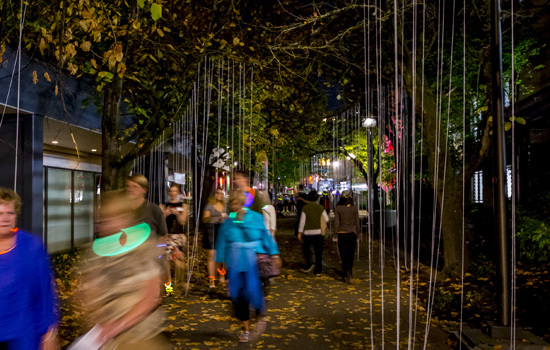 The event lasted for 2 hours, starting at dusk with 500 glow rings handed out to participants. 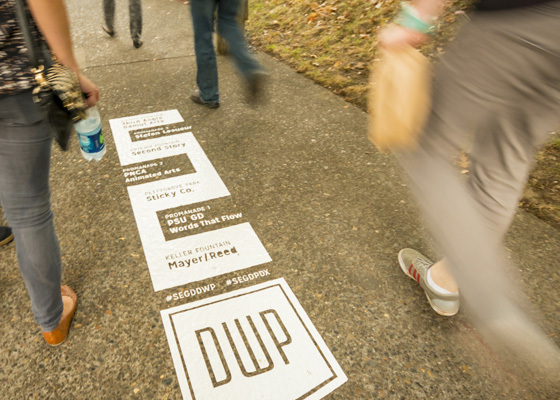 Mayer/Reed was one of seven design teams invited to participate in a Design Week Portland event hosted by SEGD (Society for Experiential Graphic Design). 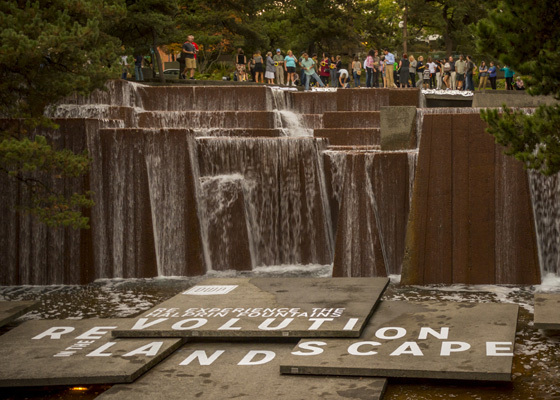 Each team designed and produced a temporary installation along Lawrence Halprin’s masterpiece, the Portland Open Sequence. 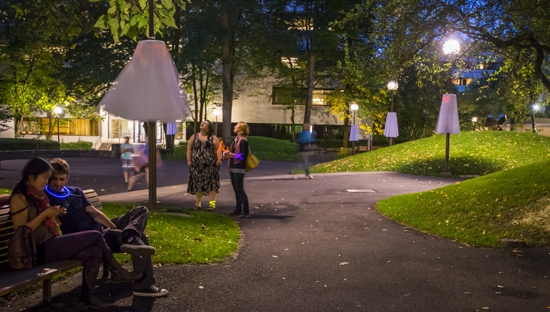 Teams were asked to explore the role of graphic design in public space and consider: Can we inspire, educate, and promote interaction? 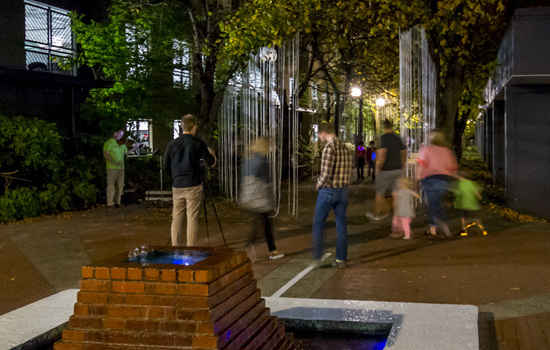 How does this create a connection to our community and stewardship of our public spaces? A magical evening transpired. Hundreds of Portlander’s joined us, beginning at Mayer/Reed’s installation “We Are All in This Together” at Keller fountain. 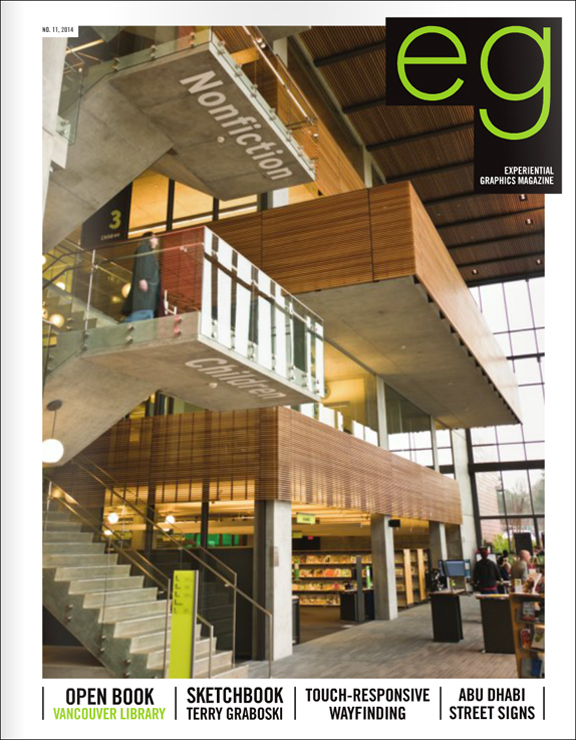 As Co-chair of the SEGD Portland Chapter with Mike Sauer, I had the honor of working with all the design teams to see their concepts become reality. 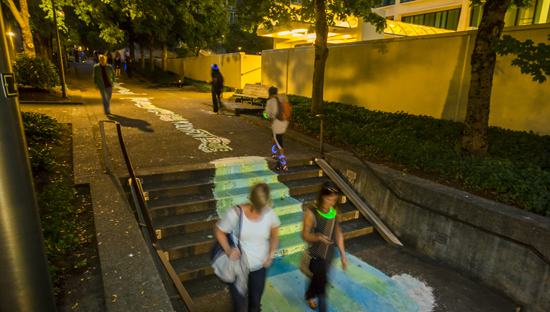 My biggest impression of the night was seeing hundreds of people and their “glow” moving through the spaces as we walked toward the Source. It was surreal to see so many people experience the spaces together. Good show Portland, good show!